Elegant and useful, these delightful glass coaster sets will definitely be clear reminders of your special day at the beach for years to come. 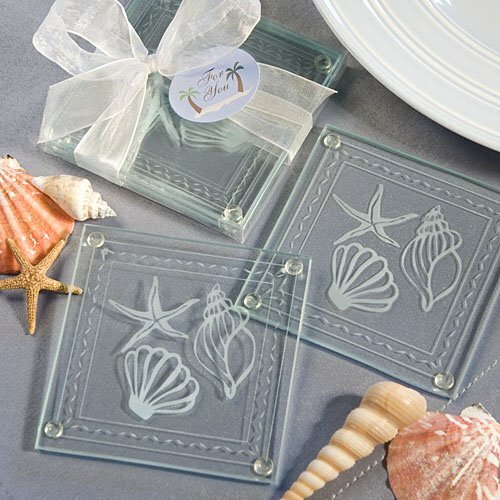 Each beautiful beach themed favor set contains two square clear glass coasters - each measures 3.5" x 3.5" and features a permanent white etched design of a clam shell, conch shell and a starfish, along with a playful wave patterned border. A sure favorite among the beach loving crowd, each Fashioncraft exclusive favor comes packaged in a clear plastic box tied with a white organza bow and an attached beach themed round "For You" tag.